Two Hearts with Arrow. Make your own charm bracelet. Two Hearts with Arrow is for those who can boast of enjoying reciprocal love in life. 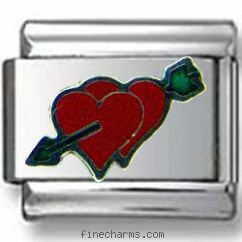 The charm features two hearts painted in red enamel pierced with a black arrow. The picture is bordered in silver toned casing and mounted upon a nickel-free stainless steel support. Perfectly matches Enamel LOVE and I love you-gold Italia charms.